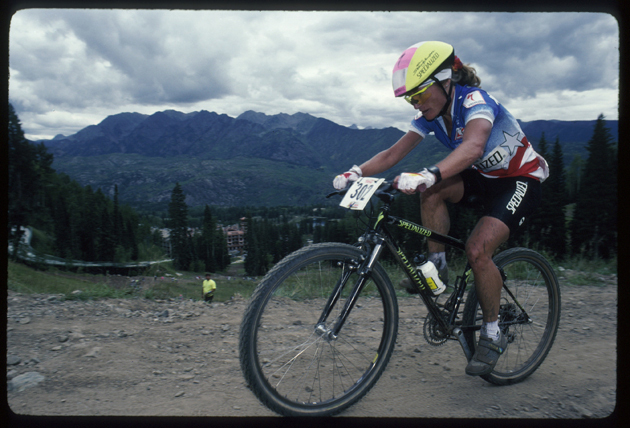 The inaugural UCI Mountain Bike World Championships in 1990 in Durango, Colo. Happy anniversary, fat-tire types. The mountain bike—that wild-hair, American-made answer to the European cycling craze—finally got global recognition a quarter of a century ago, with the inaugural UCI Mountain Bike World Championships in 1990 in Durango, Colo. Find out how it all began. Happy anniversary, fat-tire types. The mountain bike—that wild-hair, American-made answer to the European cycling craze—finally got global recognition a quarter of a century ago, with the inaugural UCI Mountain Bike World Championships in 1990 in Durango, Colo. This Saturday, Sept. 12, the 25th anniversary of that milestone will be recognized when mountain bike legend Ned Overend and former U.S. team member Todd Wells get together with more than 300 of their best knobby buddies for the Todd and Ned’s Durango Dirt Fondo in the dusty mountains of southwest Colorado. Yes, cycling’s counter-culture revolution is now officially a quarter-century old. And, like many landmark moments, it gives folks—especially former racers—a chance to reflect on this decidedly American contribution to the bike-racing world. A quick peek reveals that mountain biking has undergone a seismic shift in the past 25 years, with myriad changes in rules, race formats, equipment, and sponsorship. 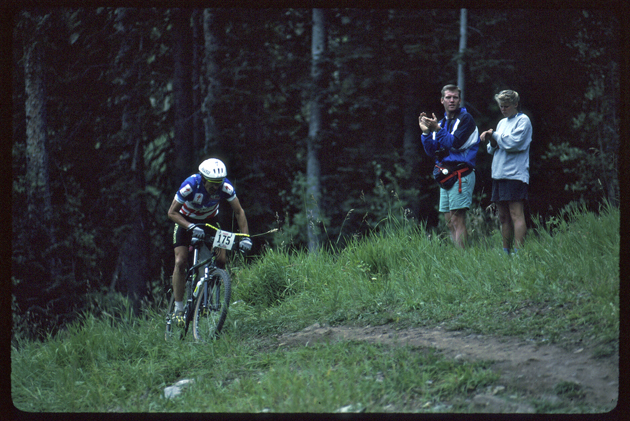 John Tomac, another Yeti rider in 1990, raced in both the cross-country and downhill events (the following year he won gold and silver in those two disciplines, respectively, in one of the great performances in Worlds history). His cross-country rig that day looked oddly out of place, with drop handlebars (like a road bike), bar-end shifters, and a solid disc rear wheel. Overend, a longtime Specialized-sponsored rider who still works and occasionally races for the manufacturer, won the inaugural cross-country championship riding a prototype frame featuring carbon tubes and titanium lugs, while most racers had aluminum bikes. Today, most top-end bikes have carbon frames. Overand’s bike also featured toe clips and straps, a revolutionary RockShox RS-1 front suspension fork, and 26-inch wheels. Clipless pedals, first introduced by Shimano, and front suspension instantly became ubiquitous. Full-suspension soon took hold among downhillers, who didn’t have the same weight concerns as cross-country racers. Eventually, though, the technology brought full-suspension to the masses, and Switzerland’s Christophe Sauser won the 2008 world championships aboard a dual-suspension Specialized Epic. More recently, larger 29- and 27.5-inch wheels have become the standard. ​“That 26-inch wheel is essentially obsolete in cross-country racing,” says Overend, noting Durango’s 25th anniversary party will also feature a vintage bike display. Herbold’s memories of 1990 are still vivid. That “media attention” speaks to another shift in a sport that was on the cutting edge of the “extreme” movement (ESPN’s original X Games in 1995 had a downhill race at Vermont’s Mount Snow). 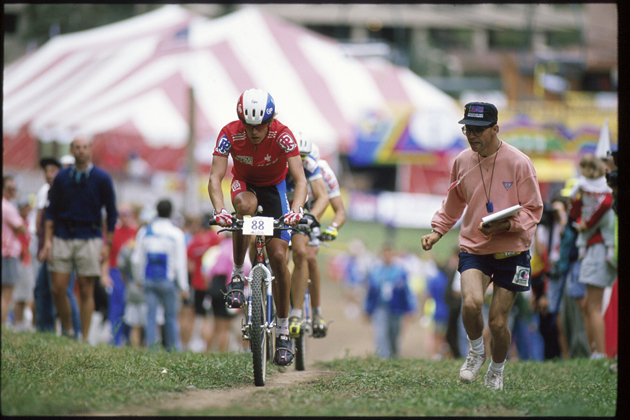 For many mountain biking fans, the sport’s apex came in 1996, when cross-country was added to the Olympic schedule for the Atlanta Games. ​Conversely, downhill racing “is not an Olympic sport but still has a huge following, especially in Europe,” says Herbold. Equipment and media coverage, however, aren’t the only aspects of the sport that have changed dramatically. The original cross-country races were epic challenges, with riders pedaling off into the wooded hillsides for 2½ to three hours. Riders weren’t allowed to accept outside help. If something broke, or you got a flat, you had to fix it yourself. Once the Union Cycliste Internationale (UCI) took over the world championships from the National Off-Road Bicycle Association (which later merged with USA Cycling), the sport, as many suspected, morphed into a more Euro-centric discipline. Cross-country courses today are shorter, designed for a TV-friendly 90-minute race while giving spectators a chance to see the competitors more often. In the same vein, the racecourses now have pit stops, similar to cyclocross, and pit crews to solve mechanical issues. Even the old guard grudgingly acknowledges that those changes haven’t ruined the sport. Unfortunately, the United States rarely has a racer in the medal hunt these days. 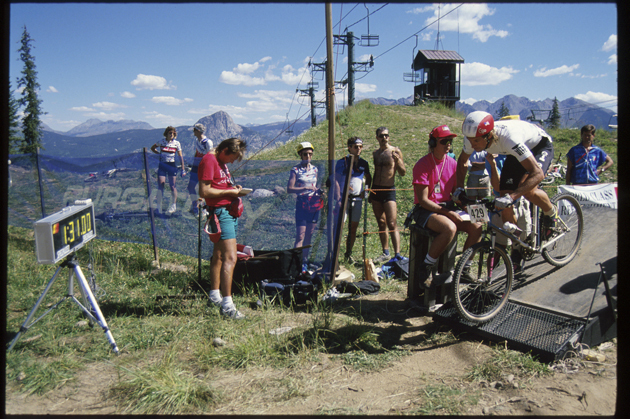 The last American male to win a marquee race was downhiller Myles Rockwell in 2000, after Americans took three of the first four world downhills (Herbold in 1990, Dave Cullinan in ’92, and Mike King in ’93). Worse, male U.S. downhillers haven’t been back to the podium since Rockwell’s triumph, although Kathleen Pruitt brought home bronze in 2009. In cross-country, U.S. men won the first two world championships (Overend in 1990, and Tomac in ’91), but haven’t captured gold in the 23 years since. Tinker Juarez came close in ’94 at Vail, but finished second to the Great Dane, Henrik Djernis (the first three-time winner). Canadian Roland Green represented North America with two gold medals in 2001 and 2002, but those were the last two gold medals for the continent on the men’s side. The last female to medal for the U.S. was Lea Davidson, who snagged cross-country bronze in 2014 (Catharine Pendrel of Canada won that year). That speaks to the sport’s the fiscal reality, which has also changed substantially in the past two decades. During mountain biking’s boom, sponsors flocked to the sport, reflected in powerhouse teams such as Trek/Volkswagon and Volvo/Cannondale. Jeep sponsored the national race series, and even Ralph Lauren launched his own RLX cycling line. Former pros all wax nostalgic about the financial windfall mountain biking represented in the 1990s. ​Another stumbling block is the absence of youth cycling programs, since most tend to concentrate on the stick-and-ball sports, or traditional sports like track and field. That landscape, however, is evolving with the advent of the National Interscholastic Cycling Association (NICA), which was founded in 2009. The key for young racers is finding their niche, and finding financial support. “Now you can find virtually any type of racing or event you would like to do,” says Tomac, 47. “You can do marathon races, 12- or 24-hour events, short track cross-country, normal cross-country racing, enduro or downhill racing. It’s all available.